History introduces Instant Expert, an exciting new line of titles offering on-the-spot knowledge to students and lifelong learners on a wide variety of topics. An energy source unrivaled in efficiency and power, oil is the driving force behind today's industries and economies. It touches nearly every aspect of our daily lives, from our food and our clothing to our cars, yet most of us know very little about it. History taces the story of oil through the centuries, from its birth deep in the dinosaur-inhabited past to its ascendancy as an indispensable ingredient of modern life. Yet many experts predict that we have already passed peak production of this vital natural resource, with the latest scientific evidence suggesting that our headlong rush to exploit the remaining reserves may have profound and perilous impacts on our future. Though the BP spill seems to finally be over, oil will continue to be a hot topic for years to come. 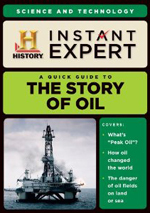 If you want to hold your own at your next dinner party, you might want to take a look at Instant Expert: The Story of Oil, a History Channel documentary. The Instant Expert series purports to provide a “comprehensive overview of a subject”. It does so via the usual “talking head” remarks from a series of experts, archival clips, reenactments and other footage. In the case of Oil, we hear from former marine biologist Dr. Richard Smith, geologist Dr. Gary Lash, former exploration geologist Dr. Jeremy Leggett, Oxford University Professor Hugh Jenkyns, geologist Dr. John Harper, author Sonia Shah, former Shell Oil geologist Professor Ken Deffeyes, former Shell UK chairman Lord Ron Oxburgh, former exploration geologist Dr. Nestor Sander, former Saudi Aramco chief geologist Dr. Sadad al Husseini, retired geologist Dr. Colin Campbell, Penn State University’s Dr. Lee Kump, McMaster University Ontario’s Dr. Darren Grocke, and University of Washington’s Dr. Ian Joughin. In terms of subject matter, the documentary looks at how oil originated millennia ago, uses for oil and ways the material affected the world, sources of oil, other ways oil impacts us and concerns about a potential world without oil. I expected the program to form kind of a “Cliff’s Notes” take on the subject, but it’s not nearly that concise and clear. Instead, it essentially acts half as a science lesson and half as a warning about global warming. We do learn a fair amount during the show, but it veers too close to “horror movie” territory for my liking. When Oil sticks strictly with history, it’s at its most compelling. Actually, I can’t really fault the parts that discuss how oil came to exist, as they provide good information. With the tale of a lone carbon atom, those sections get a bit silly at times, and they can lose the thread; I think the show could’ve told the scientific facts more simply and clearly. Nonetheless, we do learn valuable details of the various processes required to create oil. I prefer the segments that follow simply because I enjoy history to science; while I know the latter are essential for this kind of piece, I must admit they bore me to some degree. Once we get to the various uses of oil across time and changes in the modern era, the program picks up – and then it gets embedded in the scary part of the tale. Of course, I think the documentary needs to get into current problems related to oil and fears for the future – I just don’t think it needs as much of that material as we find. Instead, why not provide info about how oil is extracted and refined? That’d do much more to make us “instant experts” than all the Chicken Little squawking. There’s definitely information to be learned from this program. Unfortunately, we need to wade through a lot of less than compelling footage to get to the useful parts. The Story of Oil drops the ball. Instant Expert: The Story of Oil appears in an aspect ratio of 1.78:1 on this single-sided, single-layered DVD; the image has NOT been enhanced for 16X9 televisions. Despite the lack of anamorphic enhancement, the transfer was acceptable. Sharpness usually seemed adequate. The program consisted mostly of a mix of illustrative shots – such as oil fields or prehistoric reenactments - and “talking head” interviews. These could occasionally look a little rough and blocky, but they generally appeared reasonably accurate and concise. Moderate issues connected to jagged edges and shimmering occurred, but no signs of edge enhancement appeared. Except for a few archival bits, source flaws weren’t an issue, though some light digital artifacts gave the show a bit of a grainy look. I thought the Dolby Stereo 2.0 soundtrack of Oil was also acceptable. The soundfield had little going for it. Music showed decent stereo imaging, and a few effects spread out across the front. These were minor, though, and didn’t add much to the experience. That said, a documentary like this didn’t need a dynamic soundscape, so I didn’t mind the bland presentation. In terms of extras, only one appears: an Interactive Quiz. This provides 10 questions about facts learned in the program. It’s pretty easy, especially if you’ve seen the show. I got seven out of 10 before I viewed the documentary, so I’m sure I would’ve earned a perfect score if I’d taken it after a screening. Does Instant Expert: The Story of Oil live up to its billing? Only partially. While the show does teach us a decent amount about how oil forms in nature, it doesn’t go much beyond that. Instead, it bogs down in warnings about how oil will kill us all – which it might, but this doesn’t seem like the right place for so much of that discussion. The DVD provides mediocre picture and audio along with negligible supplements. Maybe other Instant Expert programs will prove more worthwhile, but Story of Oil disappoints.